Our backyard is songbird friendly so we prefer that the neighbourhood cats stay clear of the backyard. A cat was unfamiliar with the rule and Achilles busted it trespassing so it was compelled to seek shelter up a tree. 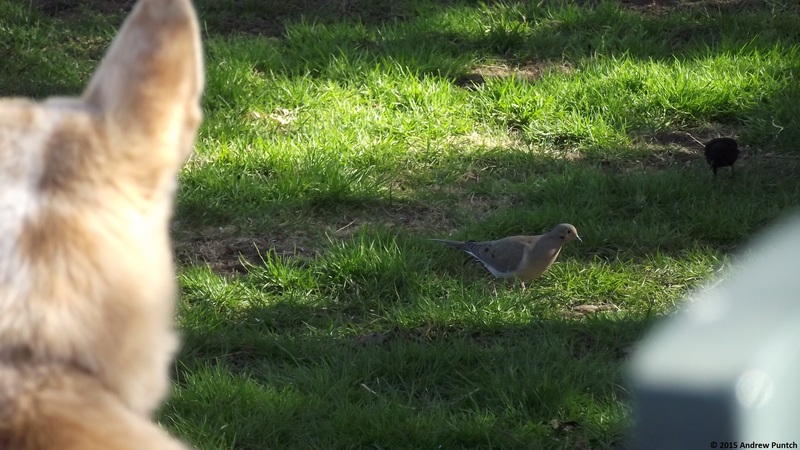 Achilles kept a watchful eye for about 90 minutes until we all went inside, giving kitty a chance to escape.
. . . Stella is uninterested in this Mourning Dove. Author andrew puntchPosted on May 3, 2015 May 3, 2015 Categories Birds, dogsTags ACDx, Australian Cattle Dog mix, dog, Mourning Dove, pet, songbirds, Stella, watchfulLeave a comment on Not to worry . . .